Now that the holidays have come and gone, I can show off one of my creations that was gifted this past weekend. 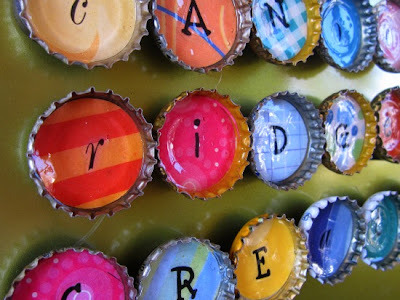 These alphabet letter magnets are a great alternative to your traditional refrigerator magnets. Not only are they cute, but they are made from recycled bottle caps. What do you think? Wow these are adorable! 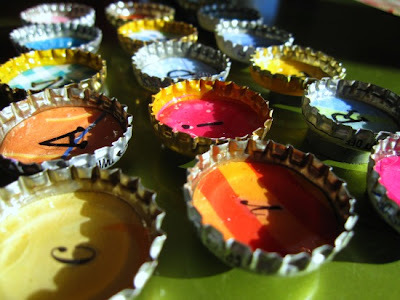 I'm going to make them right now! You are so inspiring! LOVE! Super cute! Sadly, my fridge isn't magnetized (stupid stylish stainless steel). I keep seeing cute magnets all over the place and I have no place to put them. I cant wait for the tutorial. They are great.